Unique, vivid details, sense of proportion and movement, which is so hard to capture correctly on such large surfaces are one of the biggest attitude of this murals in city of Szczecin. First one was created by the artist, originally from Wrocław city in Poland, named Cekas vel Ceka 100. The light, skinny, dancing-alike silhouette with a big, heavy, colourful and rich in detail head , hunting for a fly reminds me a bit a monster that we could watch in a movie Le labyrinthe de Pan. A duet of a grim reality from one side and a cruel world of fantasy from another, with a pinch of poetry. Breath-taking! Both of these murals were created in 2011 from the initiative of Eco Jam Graffiti vol. 4, a part of the project "Projekt EGOS", which promotes environmental activities. Eco Jam Graffiti has the idea of aesthetic transformation of the the neglected, disturbing, dirty places, through the artistic interventions, so the could become friendly, eye-catching and "renovated". 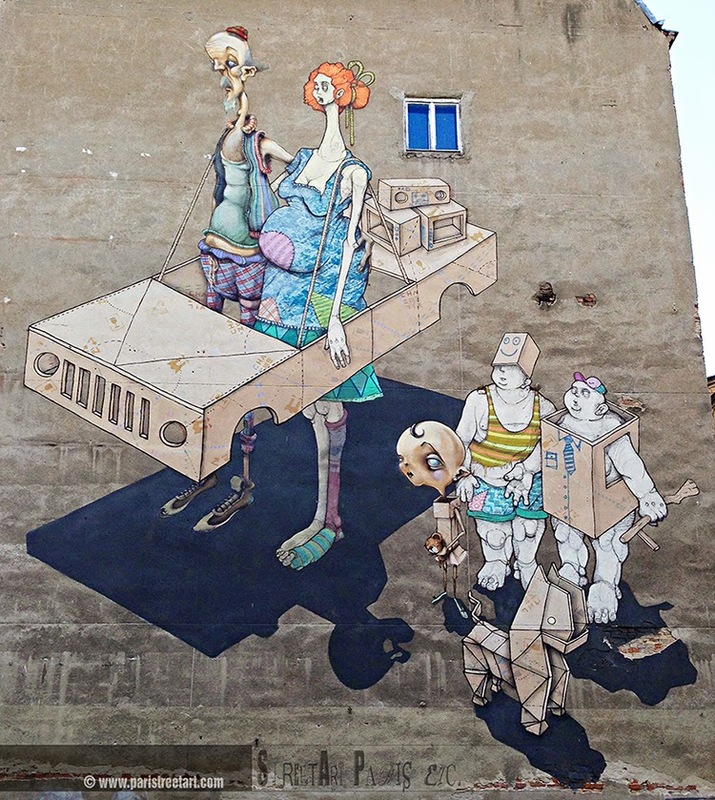 Mural presented below was created by three artists together LUMP(from Szczecin), CHAZME and SEPE (from Warsaw). The colours, the details and the concept are amazing. LUMP says: "Murals are an alternative for banners and disturbing city-lights. They destroy the visual centre. Street art is not the closed part of the gallery, where "you can watch, but don't touch". 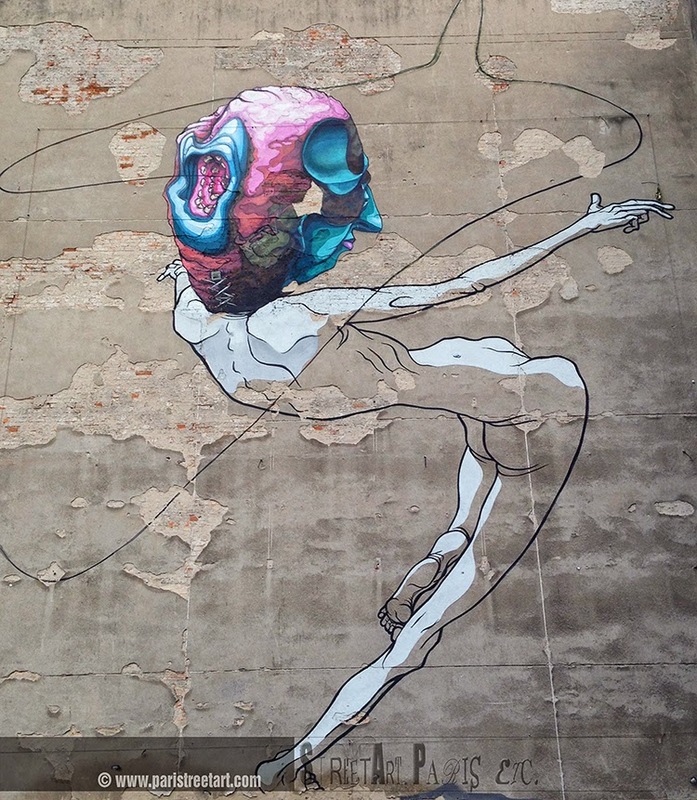 Urban art meets people, has a wide range and forces the viewer to change his perception of public space". "This painting (below) is part of the context of the city and enhances its diversity. At the same time it becomes its representative. The idea of this mural is to ask a question: to have or to be. If you don't perceive the real values, you lose the sense of existence" - adds Ceka100. Another mural of these authors, turned into an animation to watch here.